LG Display announced the creation of world's first 5" LCD display with Full HD resolution. LG Display, a leading manufacturer of thin-film transistor liquid crystal display, introduced today a 5" Full HD LCD panel for smartphones – the highest resolution mobile panel to date. Allowing smartphone users to view Full HD content in the same quality as on TVs and monitors, LG Display and its new panel significantly advances the cloud computing experience widely considered the next major internet trend. LG Display's 5" Full HD LCD panel is a step forward past existing mobile display technology. The LCD panel based on AH-IPS (Advanced High Performance In-Plane Switching) technology features 440ppi and 1920x1080 resolution, providing for the first time Full HDTV quality on a smartphone. With 16:9 widescreen aspect ratio, the panel is also 0.5 inches larger, 2.2 times denser in pixels, and 1.3 times more advanced in ppi than the preceding 4.5" panel at 329ppi and 1280x720. 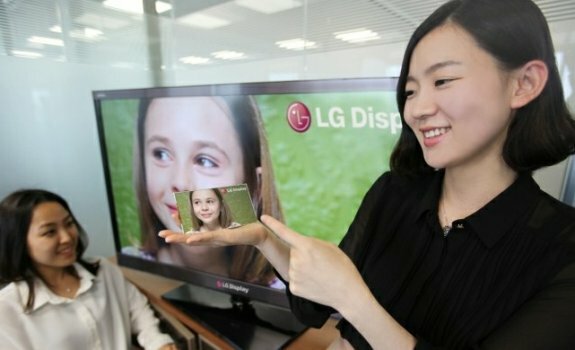 "As smartphones become increasingly valued for how well they do multimedia and with the rapid growth of LTE enabling faster large file transfers, our new 5" Full HD LCD panel is certain to prove a significant asset to the mobile market," said Sang-Deok Yeo, CTO and Executive Vice President of LG Display. "With the world's highest resolution smartphone display, LG Display continues to remain a step ahead in developing the most innovative in display technology products." The 5" Full HD LCD panel from LG Display is expected to be released during the second half of this year, and will be on exhibit for the first time at SID 2012 Display Week in Boston starting June 4.